Vaccinations are needed for kittens and adults for their protection against a variety of diseases. Following vaccination, your pet’s immune system generates a protective response. 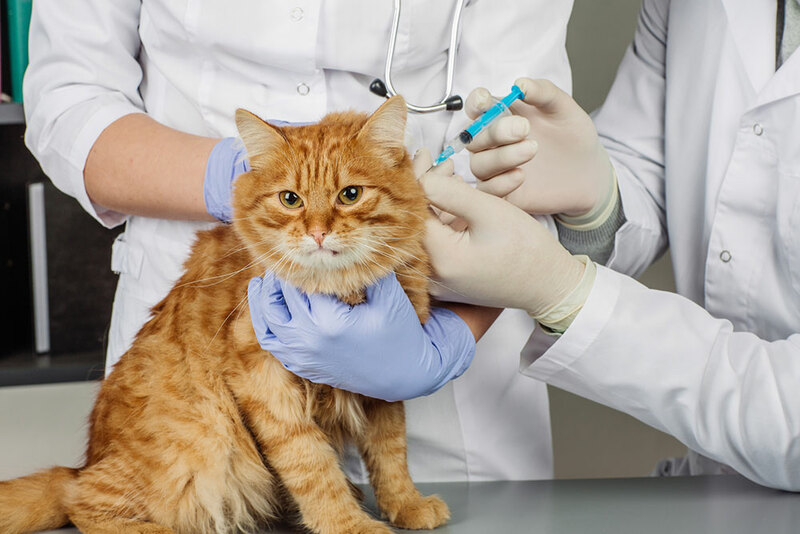 It is important that your cat is healthy at the time of vaccination so that its immune system can respond to the vaccine in this way. Any pet starting vaccination will need 2 vaccinations initially (at specified intervals) and yearly boosters for lifelong protection. We recommend that kittens are vaccinated at 9 weeks of age and again at 12 weeks of age. If treated promptly cat flu is hardly ever fatal, but it can make your cat ill for some time and may leave it with chronic breathing difficulties for the rest of its life. Two viruses are responsible for the majority of cat flu. Both viruses are still routinely seen in veterinary surgeries across the country. Despite vaccination being available, 12.5% of household cats may be infected with calicivirus. Feline Herpesvirus is another significant virus involved in cat flu and has been shown by one university study to be present in over 4% of all cats tested. This disease is well controlled by vaccination. When the disease occurs it can affect large groups of cats very quickly causing vomiting, diarrheoa, dehydration and invariably death. This virus persists for over a year in the environment. The consequences of infection with Feline Leukaemia Virus are very severe as the virus damages the immune system and in many cases causes cancer. The outcome for these cats is very poor, 50% of infected cats die within 6 months and 80% within 3 years. Unfortunately almost all veterinary practices will record cases of this disease every year. There is no effective treatment and the only way to ensure that you cat is not at risk from this virus is to make sure it is vaccinated.